As part of your Asheford curriculum, you'll not only learn how to recognize, evaluate and appraise fine antiques, vintage items, collectibles and memorabilia, but you'll also be able to put some of those same skills and knowledge to use as an Estate Sale Agent or Liquidator (ESL). Everyone knows that the majority of valuable goods and chattels to be found at estate sales are often the client's collection of antiques, collectibles, vintage items, and family heirlooms. So when it comes to a client who's in need of a professional ESL that can competently and efficiently determine the value of such items, it only makes sense that they'd turn to professionals within the decorative arts community who are not only backed by industry leading training, but who are also recognized as accredited and certified professionals within the field of antiques, collectibles and appraising. This professional training allows students to include attorneys, insurance agencies, banks, real estate companies, business owners, and private citizens as just a few of the possible clients for consideration. ESL's can also provide a wide range of services for businesses, executors of wills, trust departments, and families, by helping them navigate complicated legal obligations that can often be related to the efficient dispersal of an individual's acquired goods and chattels. That's why so many of today's Asheford Graduates are adding the services of professional "Estate Sale Liquidators" to their resumes. The comprehensive training that students receive at the Institute allows them to combine these various pieces of the decorative arts puzzle under one umbrella. Simply put, A.I.A. 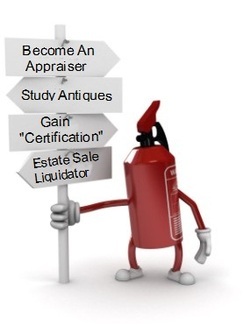 certified appraisers and antique specialists are not only qualified to conduct estate sales of this nature, but their professional qualifications will far exceed those of almost all others working in this industry - making them the natural and obvious choice for clients who are seeking the services of professionally accredited estate sale representatives. Therefore, your training at the Institute will not only make it feasible for you to operate your own antiques and appraising business, but you'll also be able to add estate sale liquidator to your list of collective services. Whether you're wanting to enter the estate sale business solely as a "certified" ESL, or perhaps you're simply interested in adding this area of sales to your already existing business; you'll have complete confidence in knowing that your Asheford training will put you front-and-center in this growing industry as someone who's already fully equipped with the necessary "knowledge" and "know-how" to work as a professional within this market. Your credentials as a specialist in the field of antiques, collectibles and appraising will speak volumes to prospective clients searching for an ESL. You will need no additional training in order to conduct these types of sales, since all the required set-up and operating information necessary to successfully run an estate sale business is already included within the Asheford Plans of study. What Are Estate Sales & What Is An Estate Sale Liquidator? Estate sales are organized sales events that are usually held at the home of someone who has moved, is recently deceased, or by someone who is simply interested in liquidating a large amount of their personal goods and chattels. These sales often have too many items for a garage sale, but are generally not large enough to warrant an auction. Also known as Tag Sales in Europe, these types of liquidation sales have been gaining in popularity in recent years throughout North America, as many aging Baby-boomers continue to downsize their residential properties and personal belongings, in favor of a more simplified lifestyle. Individuals or businesses that conduct such sales are known as, Estate Sale Agents or Liquidators (ESL). What Is Required To Be An Estate Sale Liquidator? While there are currently no federal laws or governing bodies that dictate the operation of Estate Sales, there are some basic requirements necessary if one is to be successful in this type of endeavor. Often, these requirements include a knowledge of general goods and chattels (including antiques & collectibles), an understanding of values related to these items, organizational skills related to conducting a sale, and a code of conduct and ethics to guide one in business dealings with the public. All of these requirements are not only met by the Asheford Institute of Antiques complete home-study training program, but are exceeded in virtually every category. How Can Asheford Train Me As An Estate Sale Liquidator? With training from the Institute, you'll be covering all the essential areas needed to become a professional ESL - you'll learn about antiques, collectibles, memorabilia, and, as a certified appraiser you'll be able to legitimately appraise the value of your clients goods and chattels. In addition to this, the Asheford Program also includes a complete section of the Course that is solely devoted to owning and operating your own Estate Sale Liquidation Business - including sample contracts, and examples of estate sale policies. Your Diploma and Appraisal Certification from the Institute, can put you well out in front of the competition when it comes to operating an ESL business. From providing you with in-depth training in the field of antiques, collectibles, memorabilia and appraising, to showing you how to run and operate your own ESL Business, the Asheford Course will put you ahead of the competition in virtually every category when it comes establishing yourself in this lucrative field. 1. Your training with the Institute will give you the knowledge to accurately identify antiques and collectibles - usually the largest and most valuable component of an estate sale - allowing the client to feel confident that the liquidation of their personal belongings is in good hands with a knowledgeable and competent representative who has been trained in these fields. 2. Your credentials as a "Certified Appraiser" from the Institute, will speak volumes to prospective clients, who will know that their goods and chattels are being properly evaluated prior to being offered up for sale. 3. The Asheford Program offers a complete "Profit" section of the Course designed to show you how to set up your own antiques, appraisal or even Estate Sale Liquidation business - everything is covered, from A to Z. 4. We've got history on our side. Since 1966 we've been showing students the value of antiques and collectibles, the art and business of appraising and more... Our reputation as an industry leader in these fields can help "seal-the-deal" with prospective clients who are looking for a "certified" ESL business. When you receive your Diploma and "Certification" from the Institute, you're telling clients that you're backed by a school with over 45 years in the business! 5. Receive the "Asheford Seal Of Approval" for your web site and business, indicating that you have not only participated in comprehensive training, but that you are a successful graduate of an "internationally" recognized Institute. 1. Without proper training in the field of antiques, collectibles, and memorabilia, clients will feel less likely to trust your judgement when it comes to their goods and chattels. 2. Without the designation of "Certified" Appraiser most clients will have little faith in your abilities to accurately appraise their items correctly, and may look elsewhere. 3. Setting up an ESL business within the antiques, collectibles and appraising field, without knowing the "ins" & "outs" of what to do can prove costly. 4. Without an established history to back you up, starting an ESL business can be difficult - new businesses are often perceived as a "bit of gamble" by clients, unless they can show some form of credentialing from a long established source. Clients want to know that the credentials you present can be trusted. 5. Lack of recommendations, or referrals from a "recognized" educational body can hurt your prospects for success. Need More Reasons To Get Fired-Up About Asheford ESL Training? Q: Am I going to be learning about the goods & chattels that I plan on selling (especially the valuable antiques and collectibles), so that I can properly identify these items for clients and customers alike, without having to pay a third-party for assistance? Q: Will I be receiving training as a "Certified Appraiser" within the field of antiques, collectibles and memorabilia, so that I am able to appraise "client" items on my own, and not have to pay for the services of a certified appraiser? Q: Will the training that I receive from your program enable me to charge more for my services, when compared against other Estate Sale Liquidators, who are not credentialed in the field of antiques, collectibles and appraising? Q: Are the credentials I'll be receiving from the organization that's training me, meaningful, respected and recognized by other groups, businesses and related societies? A: When you enroll in the Asheford Institute Of Antiques, the answer to these questions is going to be... YES! In the end, what usually separates one successful estate sale liquidation company from another, often comes down to one simple criteria; "knowledge." If you have it, your services are going to be in demand - if you don't - your business is likely going to suffer. At the Asheford Institute, we train our students in all the necessary fields that are required to gain this type of knowledge. Unlike other estate sale liquidators, who may only have limited (or zero knowledge), of antiques, collectibles and appraising, the Institute will impart to you - systematically - all the required skills and information you're going to need in order to own, operate, and run a successful Estate Sale Liquidation business. We've been doing it for over half-a-century now... so we know what works!